In this tutorial, we will be covering how to perform some basic IPTables changes that will greatly help secure your server. This is done on a fresh install of CentOS 6.5 64bit in our Atlantic.Net Cloud. Using the built in CentOS IPTables is a great way to guarantee a secure cloud server, because it is already installed and running when the server is created. To verify this, you should just have to run the below to check the status of IPTables and it will print out its current rule sets. If you are not running as the root, simply add a sudo to the front of that. We will be continuing this securing tutorial as if you are the root user. To edit your IPTables, you would first need to go to its configuration file. In this example, we use vi however you can use whichever editor is your favorite. Keep in mind, when adding new rules to either INPUT or FORWARD sections, it is a great practice to keep the new rules lumped together with like rules. INPUTs with INPUTs and FORWARDs with FORWARDs. You will also want to make sure that any rules you add that allow a new port through are listed ABOVE any reject statements for that rule set. If they are listed after the reject lines, the rules will not take effect. 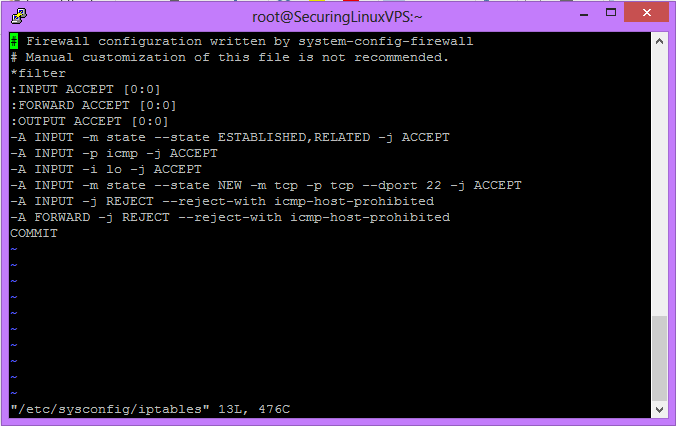 To see the output of what IPTables is doing and blocking with its rules, you can run the below. It will print out the rules you have and anything packet wise about dropping connections or allowing them through. Thank you for following this how-to. Please check our blog for a host of articles and how-to’s including other IPTables related posts such as How to: Basic IPTables File Configuration and How to: Basic IPTables Troubleshooting; and consider a market-leading cloud hosting server from Atlantic.Net.